Has anybody seen this fence? In the early years of our time at the Manse, in the mid-’60s, there was an old (actually “vintage” sounds nicer, and more accurate) wire fence along the edge of the front yard, with a gate in it at the end of the flagstone pathway that led from the steps from the front porch. Along the top of the fence, every 12 inches or so, was a decorative maple leaf – just like in this painting by Robert Bateman. I may be wrong, but I think that that style of fence was not uncommon in those days. But at some point, probably in the late ’60s, it was decided to get rid of the old fence and the gate – and only many years later did I realize what a beautiful thing it was that the property had lost. I hope to goodness it didn’t end up in the dump, but I fear it probably did. Wouldn’t it be amazing to find some fencing like that now and put it up? So here’s a question: has anyone seen any maple leaf fencing like that anywhere? Even better, somewhere that a person could buy it? 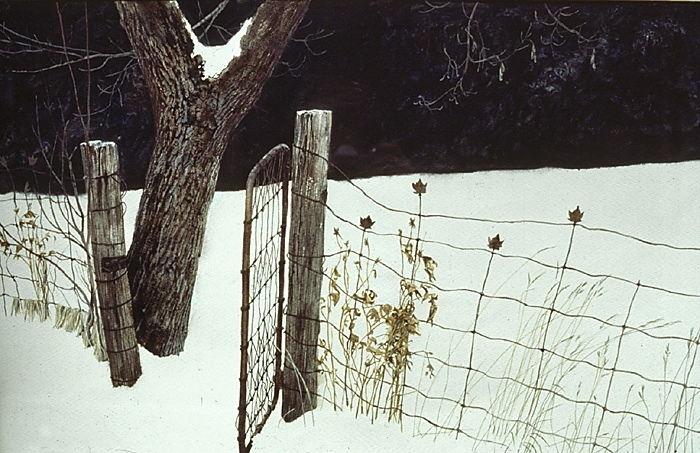 This entry was posted in Uncategorized and tagged '60s, fence, Robert Bateman by Katherine Sedgwick. Bookmark the permalink. A few years ago when I saw the fence being torn down I took a sample. Great minds think alike…It is reassuring that we work for good not evil! That is amazing, Elaine! You must have known even then that something beautiful was being taken away. Do you still have that sample? And yes, good not evil: maybe that can be our slogan!